Space can best be defined not by looking at borders and territories but, rather, by focussing on movements of crossing and re-crossing. Today, the horizons of traditional Area Studies have to be opened up by innovative TransArea Studies which generate a new vision of entangled and connected histories and multi-, inter- and transcultural developments. The vectorization of all kinds of knowledge is on the agenda: the movements of the past are still present in the movements of today. Could there be a better field for this theoretical shift than the Caribbean, one of the outstanding producers of cultural and literary theories of our time? 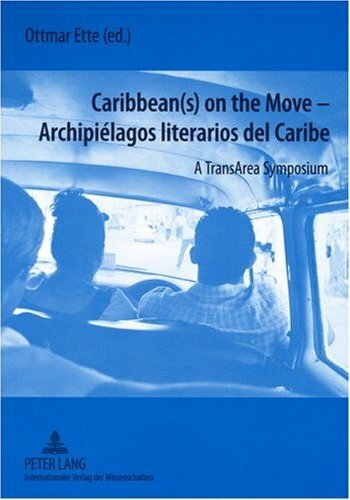 The articles gathered in this volume accept the challenge of portraying the Caribbean(s) on the Move and of rethinking the Caribbean from the standpoint of its world-wide mobile cultural networks. Ette, Ottmar, ed. Caribbean(s) on the Move – Archipiélagos literarios del Caribe: A TransArea Symposium. Lang, 2007.